Hand-crafted stoneware urns with a paw print motif. The Large is available to order here. 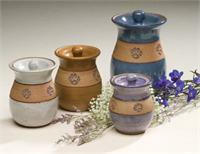 Also choose from 2 different glazes: Blue and Oatmeal. We apologize, the purple and brown are no longer available.